Stage Rush is the official game of the famous rock band "Imagine Dragons" developed by Zig Zag Zoom. It's a fun and fast-paced endless runner game in which you choose to run as a member of the band to the beats of their hit songs in through Las Vegas / Paris environments. 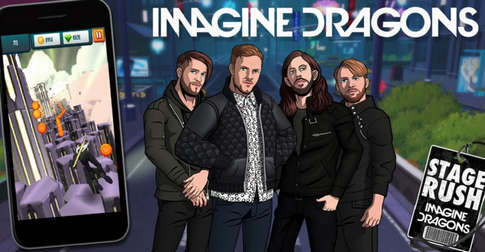 Stage Rush: Imagine Dragons has just been released today retailing for $1.99 on Android. And according to the band, for every purchase of the game in its first month, $1 will be donated to the Tyler Robinson Foundation to help families deal with the financial and emotional costs of pediatric cancer. After the first month, 25 percent of the proceeds will go to the foundation. - Play as a member of the band and try to beat their songs “Demons,” “Radioactive,” “Shots,”..
- Each download supports a sick kid in need. If you have the cash, head down to the Play Store and buy the game, it's for a great cause! Other search terms: "Stage Rush Imagine Dragons mod / Hack apk (coming soon)", "Stage Rush Imagine Dragons free download".